MHA Labs’ is a skills development strategy that works concurrently with investments in academic excellence, technical expertise and college/career navigation to increase the number of youth achieving college, career and life success. Over the the last two years, the research on the impact of non-academic factors such as “grit” and persistence has reached a tipping point creating national focus on the social, emotional and cognitive skills of youth. While some have interpreted “persistence” as the next silver bullet solution, MHA Labs makes no claim that 21st century skills are sufficient on their own to produce a college and career ready youth. 21st century skills are nonnegotiable to success but are not solely determinant. Youth live in complex social and economic conditions that regulate the successful outcomes of even the most college and career ready youth. To maintain this holistic readiness focus, MHA Labs developed a logic model where 21st century skills are authentically embedded into all learning settings. These settings include home, school, enrichment programming, and employment. 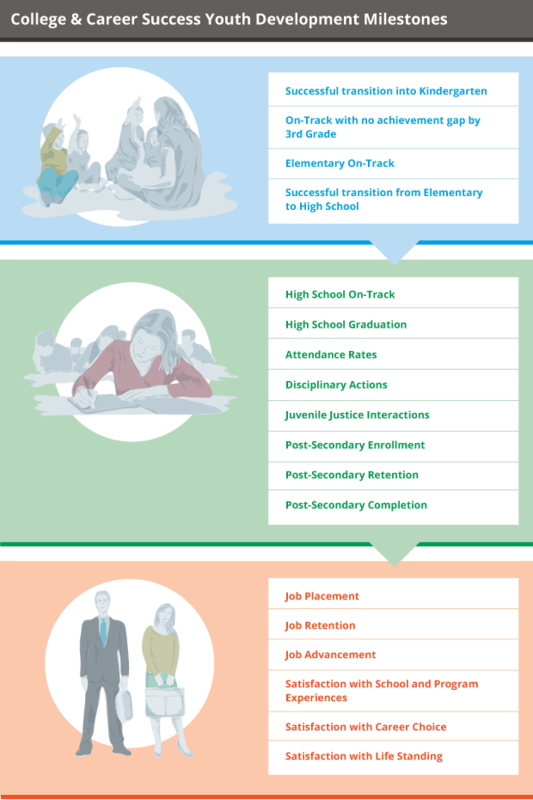 Each phase of the logic model drive performance towards 18 measurable cradle to career milestones. MHA Labs has included satisfaction outcomes to ensure that youth are not driven towards college and career readiness at the expense of aspirations that will bring personal, family and life fulfillment. Goal: Build collective impact strategies where youth development stakeholders agree to align to and use MHA Labs Building Blocks and Assessment Tools as common 21st century skills learning and performance standards. Impact Metric Overview: MHA Labs uses “Impact Impressions” to track the number of stakeholders that are building awareness the Skill Building Block framework. Managing the exposure process is highly critical for a tool to meet its expectations in the market. In preparation for launch, MHA Labs worked with professional development subject matter experts to design a user adoption model. After careful analysis, it was determined that how a user was first exposed to the tools would be the most significant driver of future successful implementation. This is particularly true for sectors such as public education where skill standard and assessment reforms are highly polarized topics. Note, when user impressions convert to user practice or program activity this represents the metric of adoption. This will be reported in Section Two. Goal: Work with users in MHA Labs collective impact communities to introduce and use engaging practices and programs to build youths’ 21st century skills. Note that programming includes but is not limited to lesson planning, program planning, activity planning, job descriptions, job tasks and job project plans. Impact Metric Overview: After a user is exposed to the skills framework, they move towards practice and program implementation. Similar to the common core implementation, MHA Labs does not mandate a specific curricular intervention but promotes authentic, contextual integration into the subject matter of the class, program or employment setting. This approach is even more critical in the field of 21st century skills with are inherently subjective and contextual in nature. Instead of attempting to regulate human behavior, MHA Labs promotes a model where youth apply skills across the wide range of learning contexts where they are provided goals, expectation and feedback based on their performance in context. A youth’s success in this type of cross-context model drives adaptability and social awareness, where a youth learns to decode and adapt to the success requirements of a setting rather than relying only on one set of standardized behavior. Goal: Further develop MHA Labs assessments to meet the major developmental milestones of youth which include graduating from high school college and career ready; skill-based recommendation and admissions to college and employment; and skill based performance review and promotion on the job. Impact Metric Overview: MHA Labs tracks the use of its assessments across cradle to career contexts. MHA Labs has developed this system of formative and summative assessment tools to benchmark skills performance in context and communicate results. Use of assessment is not limited only to rating the scorecard which is typically where the majority of youth development assessment end their function. MHA Labs prioritizes the formative and summative use of assessment data to support, develop and translate a youth’s skills into asset building and applied productivity. Impact Metric Rationale: MHA Labs twenty-member volunteer Data and Impact Alliance developed a comprehensive set of data use cases to support the rationale for assessment use. Alliance members debated each use case through the lenses of research and evaluation science as well as the real-world implications. All use cases had to reach 100% agreement among Alliance members. Goal: Track how MHA Labs formative assessment data increases skill building supports for youth in their learning setting. Track how MHA Labs recommendation and employer appraisal data is effectively used to increase access to opportunity. Goal is to use MHA Labs recommendation data as a more predictive tool for education and job opportunities. For employers, goal is to use MHA employer appraisal data as a skill-based tool for promotion and advancement. Impact Metric Overview: Increasingly, assessment data is used to either summatively assess a youth’s performance or measure growth over time to evaluate the impact of the learning environment. Yet most subject matter experts agree that the measurement of behavioral still is contextual and subjective. As a result, behavioral assessment data is not deemed a reliable source for measuring growth over time or for value-add analysis. Instead, MHA Labs prioritizes the use of assessment data for skills development and access to opportunity. Read more about MHA Labs outcomes research project with Lindsey Richland, University of Chicago Department of Comparative Human Development funded by the Hymen Milgrom Supporting Organization. This new research-practitioner collaboration will examine 21st Century skills, cognitive and non-cognitive competencies necessary for high quality employment in the 21st century, in urban youth. The project aims are to better understand 1) the relations between cognitive and non-cognitive competencies and employment trajectories, 2) competency ratings and the context of evaluation, and 3) the role of evaluating competencies on a training program. Specifically, this research project will examine the role of assessing and training 21st Century Skills on ethnically diverse, economically disadvantaged youth’s employment and post-secondary schooling trajectories in the context of a novel internship program providing skills training and corporate IT employment for high school seniors (Genesys Works, http://www.genesysworks.org/twincities/). Approximately 300 rising seniors selected to participate in Genesys Works in Minneapolis will be followed through an eight-week summer training program, after which some of the youth will be hired into one-year paid IT internship positions in major local and national corporations in an afterschool capacity. The research program will examine relations between a) 21st Century Skills as assessed by a range of people across three contexts: employers, teachers, and community members, b) Cognitive processing skills including working memory, executive function, and relational reasoning, and c) employment trajectory at three time-points: hiring decisions, employee review/ raise decisions, and post-program employment or post-secondary education persistence. These scores also will be used to qualitatively examine how the use of free MHA tools for identifying and assessing key 21st century competencies (both formally and informally) impacted the training provided to individual students as measured by weekly program grades, written feedback comments, and performance on the technical curriculum and assessments. Goal: Track how many youth engaged in 21st century skills development programs meet their college, career and life milestones. Impact Metric Overview: MHA Labs will focus on tracking progress on established, measurable milestones that are proven to impact long term social and economic stability for youth, such as high school graduation, college completion and living wage employment pathways. Conversely, MHA Labs will also measure its toolkit’s ability to reduce disciplinary action and juvenile justice interactions which work to limit a youth’s achievement of positive milestones. MHA Labs will take into consideration the entire readiness skills portfolio of students when measuring to what extent 21st century skills were responsible for success. MHA Labs has been consistent in its messaging that 21st century skills success is part of a larger readiness equation that drives achievement in school, college, career and life. That 21st century skills are not sufficient in their own right but must be combined with competency in literacy, math, technical skills, and college and career navigation abilities. These four domains have been determined to be the primary components of college and career readiness in the current economy. Impact Metric Rationale: At this time, MHA Labs in constricting its outcome measures to widely accepted reliable measurement instruments, school data, college persistence data and employment data. MHA Labs needs to do this in order to successfully validate its own assessment tools that are more subjective in nature. MHA Labs does support the stand-alone role of 21st century skills in the development of outcomes attributed to social emotional and other noncognitive factors. MHA Labs also endorses research findings that demonstrate the long term positive impact that social emotional competencies and attitudes have on future achievement.